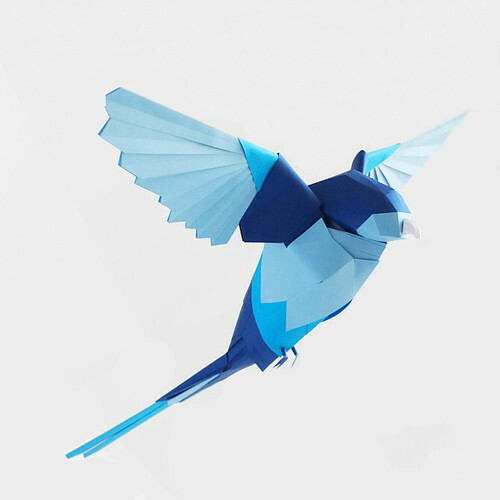 Check out these wonderful paper sculpture parrots that Marine Coutroutsios of Sydney, Australia created for a Telstra store window. I was introduced to Marine's vibrant work on Instagram and was interested to learn more about her, especially after reading she relocated to Sydney from Paris not too long ago. The colorful flora and fauna of Oz figure heavily in her work as a paper artist. In France, Marine was a clay sculptor and residential interior designer. For the past four years she has been honing her skills with scalpel and scissors. Marine enjoys doing commissioned works such as the Telstra assignment for which she was shown bird images that had been presented in a short film in the store. Her task was to make dimensional models similar to the ones on the screen. 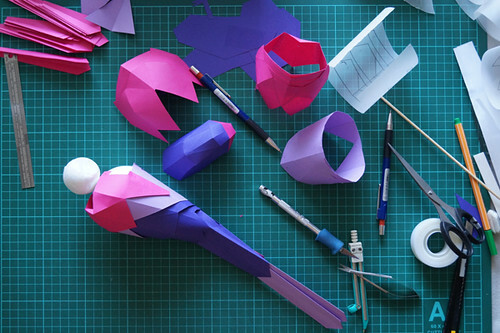 After creating a prototype from copy paper, she used 120 gsm paper to construct ten sculptures in vivid hues. 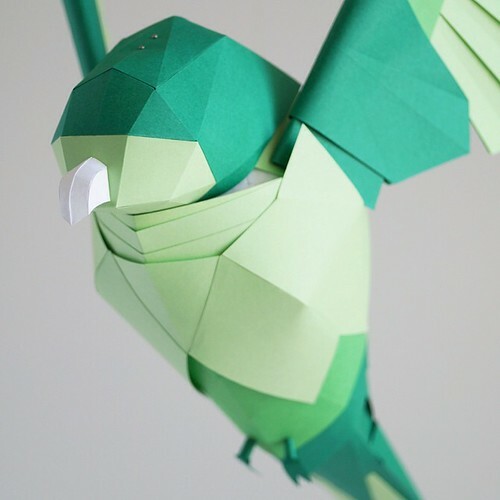 Each bird was composed of 85 parts that were folded and curved to fit together like a puzzle. My move wasn't planned actually. My partner got a job offer in Australia a few months before we jumped on the plane that brought us to beautiful Sydney. From there I had to start a new life: new job, new language and new culture. A year before that move, I had quit my job as an interior designer to follow my partner to the U.S. There I allowed myself to create without any client's obligations. What led you down the path of paper artistry? I started to draw again, just for the sake of drawing, and then happened to explore the possibilities of a scalpel I had. I loved it! My drawings were much better turned into 3D sculptures. I could say that working with paper came quite naturally as I've always been very crafty. I made a ton of things my hands when little; I also worked as a sculptor after uni. My work has evolved a lot since my beginnings and I hope it will keep on going. For now I mostly do installations for commercial projects, as well as private commissions. 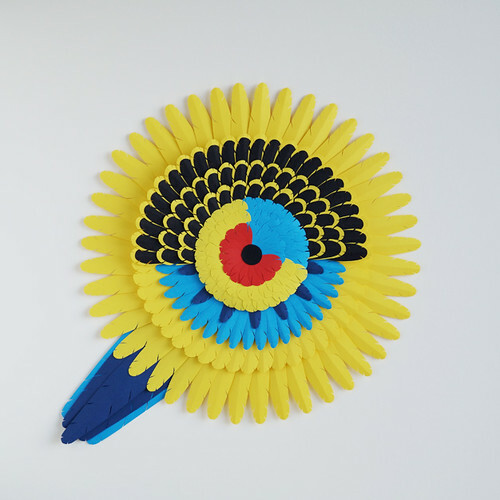 Marine was inspired to design a series of bulls-eye style rosellas after moving to Sydney. 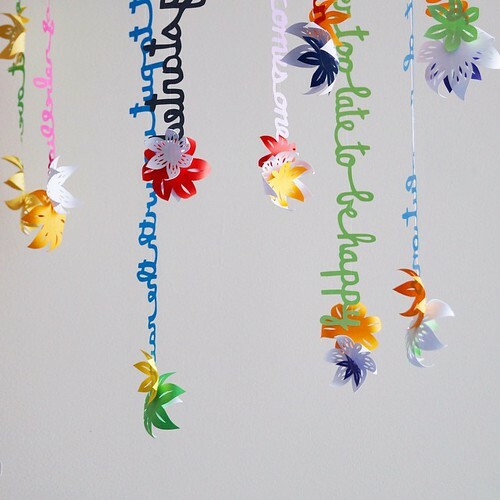 Each abstract bird is composed of hundreds of cut paper feathers. See the entire colorful flock on her website. 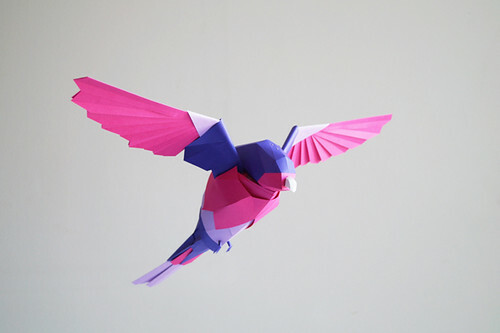 For those of you who happen to be in Sydney, Marine's dimensional paper parrots can be seen in the Telstra store on George Street. And if you're on Instagram, I think you'll enjoy following Marine Coutroutsios as she not only shares her paper projects, but also very beautiful images of Australia. These are stunning! Those birds are flying through the air. Thank you for sharing Marine's work. Oh sooooo clever - thanks for sharing! I can iris fold, but oragami I'm all thumbs - LOL! Love to see what others can do!!! 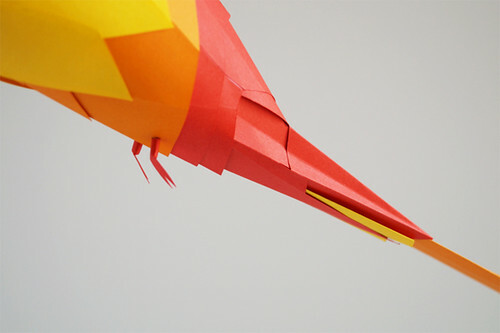 I agree, Jan. Marine has a special talent for visualizing how to construct a 3D figure from flat paper.